The focus of this product is to restore and maintain the health of joint cartilage. When the cartilage and collagen in the joints wears down, it causes inflammation and pain and becomes osteoarthritis. This product contains ingredients that are supposed to help joints retain more cartilage by providing the molecular building blocks the body is supposed to be able to use to create more cartilage, which staves off the deterioration people with osteoarthritis face. The primary active ingredients also help cartilage stay shock-absorbent, so that the joints don’t have to get hit with the full force of every movement and step, which can add to inflammation and pain as well. Additional ingredients act like pain killers, providing holistic anesthetic properties and helping to stimulate the body’s natural immune response, which is how it deals with inflammation. Other ingredients focus on helping cells maintain their health by acting as antioxidants, stopping the processes that lead to cellular degeneration. Top Benefits: Ingredients are all-natural, most seem to help with inflammation and joint health in some way. Negatives: You can’t buy it without signing up for a monthly membership to a multilevel marketing company and agreeing to be charged automatically on a monthly basis. 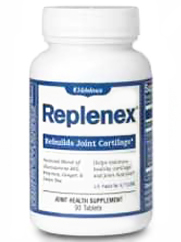 The only place we found selling Replenex was the product’s main website, which you need to be a member of to buy. A version of this product was once available on Amazon, but it’s been discontinued there. The ingredients in this product all come from plant or shellfish sources, so while it doesn’t contain any soy or gluten, people with shellfish allergies will have to be wary of this product. The formula is fairly simple, containing ingredients that are common in natural joint health supplements. The tablets are meant to be taken 3 times daily, which is reasonable to expect from a nutritional supplement. Glucosamine Hydrochloride: A supplement extracted from shellfish products, and a common ingredient in joint health pills. Glucosamine is prescribed for it’s ability to strengthen the cushions that surround the joints. These cushions keep the joints protected from shock and protect the cartilage as well. There are actually two forms of glucosamine, sulfate and hydrochloride, and experts typically say the sulfate version works better. This is because “sulfate” part is the main thing that’s supposed to work on the joints. Ginger: A root that’s used for natural medicinal remedies, mainly including involving the treatment of stomach problems like nausea. It’s not clear why it was included in this supplement, however, since it doesn’t have to do with joint health. Green Tea Leaf: An anti-inflammatory, that is supposed to work by reducing the production of prostaglandins, the molecules that cause inflammation in the first place. It also contains antioxidants for improved cell health. Bromelain: An enzyme found in pineapples, on that’s been used in natural medicine as a muscle relaxant and an anti-inflammatory. It’s supposed to also work as a natural anesthetic, for providing pain relief. Unfortunately, it doesn’t seem to work when taken by itself (according to WebMD), and there isn’t much evidence for any of its other medicinal benefits. This product contains some ingredients that are pretty popular in the world of natural joint health, mainly glucosamine. The ingredients all come from natural sources, something many people find to be an important factor in what sort of health projects they choose to consume. The product doesn’t contain any common food allergens like soy, dairy, and gluten (although it does include shellfish), so people with sensitivities to such things will be in luck. The dosage size is also reasonable, with customers expected to take one pill three times a day. This is in contrast to some supplements for joint pain,which require people to take as many as 5, 6, or 8 pills every day. This product has a lot of problems with it. To start off, we’ll address the ingredients. While this product contains glucosamine, it contains the “hydrochloride” version of it, instead of the “sulfate” version that’s considered the superior version. As a result, this form of glucosamine may not be as effective as other supplements with contain the better version that has more support for it working. It also contains a few ingredients that have very little science backing them up, including bromelain, which is only used by naturopaths and has no scientifically-sound clinical trials saying that it’s effective for treating inflammation and pain. It also contains papain, an ingredient that comes with lots of dangerous side effects and is especially dangerous for women who are pregnant. Not only that, but evidence for it working for inflammation is slim at best. There is no price available on the website for this product, which leads to the second problem: the company itself. Melaleuca represents itself as a members-only exclusive health supplement club, but in reality it appears to be a multilevel marketing scheme. It claims on the website that all members are referred by existing members, and that you need to sign up in order to be eligible to buy the products they sell. They have a page dedicated to telling people about how much they can earn by selling their products directly. Because it appears you can’t just buy the products anywhere, you’re stuck with buying it from a representative or from the member’s only website. If you sign up for a membership, we learned that you will be obligated to commit to a monthly expenditure on their products, and that if you don’t choose what is sent to you, they will send you things (even those you may not need). This appears to be the only way to “buy” Replenex. Many people have expressed dismay on the Better Business Bureau page for this practice, as it forces customers to spend money they may not want to spend on things they may not need. Multilevel marketing schemes have been criticized as deriving most of their money from their salespeople buying product to resell, as opposed to on the merits of the quality of the products themselves. What do customers think about Replenex? This last one doesn’t seem to be a real review, more likely a post by a Melaleuca member who is trying to use Amazon as a way to sign more people up for Melaleuca in order to get a referral fee. Replenex may very well be a natural supplement, but it doesn’t have a lot going for it. On the one hand, it contains an inferior form of glucosamine (glucosamine hydrochloride), making it potentially less effective than other products that contain glucosamine sulfate. It contains two major ingredients that have very little proof of working (bromelain and papain), the latter of which comes with some awful side effects when used too much, including throat erosion and dangers to pregnancy. The main problem, though, is the way to buy it. Since it appears to only be available for people who sign up to become “members” of Melaleuca and have to pay monthly fees, there’s no simple way to just purchase the product, making getting it a hassle. The lack of positive customer responses only further helps the case that this is not a great product. 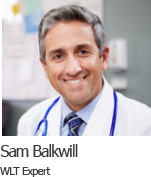 People looking for joint health supplements are better off buying products from companies that just let you purchase the products without getting you roped into some sort of auto-charge, multilevel marketing scheme. 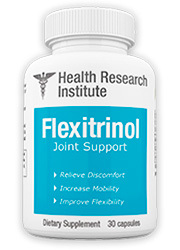 Our joint product of choice is Flexitrinol. Compared to the competition, it’s the best all-natural, effective alternative. Flexitrinol has gotten great reviews from customers and health experts for its quality.